The JULIA32 Full HD TV: better red than dead. 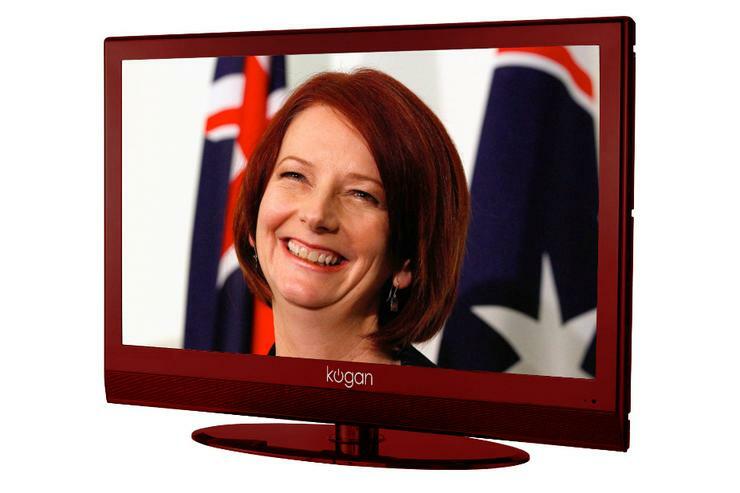 The ever-canny Kogan Technologies has jumped on the Julia Gillard bandwagon with the release of a new HD TV: the JULIA32. The Kogan JULAI32 is a 32-inch Full HD television boasting two HDMI outputs, a USB port capable of playing movie files and a striking all-red design. Last year, Kogan Technologies released the similarly themed KEVEIN37: a 37in HD TV that paid homage to the 'KEVIN 07' slogan Kevin Rudd employed in his successful election campaign. “Superseding the outdated KEVIN37, the JULIA32 comes with a host of new and improved features, and most importantly -- a funky red design.” Kogan stated in a press release. The timely JULIA32 is a revamp of its KEVIN07 predecessor, sporting a smaller, sturdier cabinet design and an inbuilt personal video recorder (PVR). The PVR lets you pause live TV and record shows directly to a USB thumb drive. Other noteworthy features include an inbuilt HD digital tuner, a Full HD (1920x1080), 32in Samsung panel, a versatile swivel stand and an 8ms panel response time. The JULIA32 is available direct from Kogan Technologies for $499. For more information, visit the Kogan Technologies Web site.